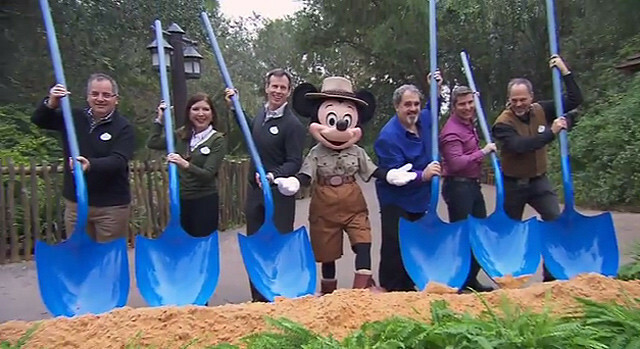 Avatarland Breaks Ground at Disney's Animal Kingdom. With the official closing of Camp Minnie-Mickey attractions, Avatarland had it's first big day in the spotlight. 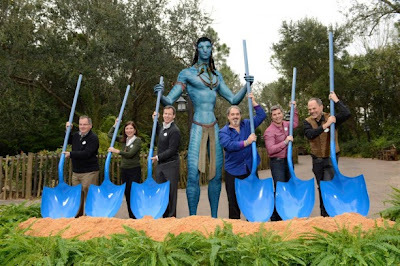 On January 10th, Disney Parks Blog posted up this image of their groundbreaking ceremony, with "Na'vi" themed shovels and some photoshop work on "Jake Sully" in his Avatar form to show a size reference. When in reality it was really Mickey Mouse who attended the groundbreaking ceremony. Disney didn't really leak much information about this new 'land' coming to the park. Currently no one is sure what attractions will be added into the "Avatarland" project. However, with adding Avatarland to Animal Kingdom Disney is hoping that the park will become a full day experience and keep guests in the park longer. No word right now if this will expand the parks operating hours but between Avatarland and this addition of a new night-time show, it's very likely the park will finally buck it's standard 6pm closing time.